One Direction have debuted “Made In The A.M.” at No. 2 on the US Billboard 200 album charts. Billboard reports the UK group’s latest record enters the chart with opening week sales of 459,000 units, including 402,000 in pure album sales. “Made In The A.M.” took second spot behind Justin Bieber’s “Purpose”, which sold 649,000 equivalent album units, including 522,000 in pure album sales. One Direction’s fifth studio release was previewed with videos for the lead single, “Drag Me Down”, and the follow-up tune “Perfect”, as well as several other tracks in the days leading up to its official release. The project marks One Direction's first album without former member Zayn Malik, who left the group in March. “Made In The A.M.” will be the band’s last full record before taking an extended hiatus in 2016. 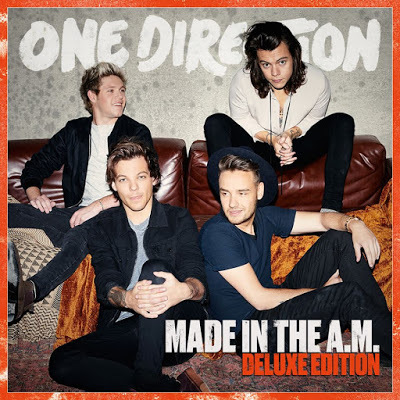 AUDIO: Stream new One Direction album Made In The A.M.